NEVER RECORDS acts as a functioning record store, an art installation and on-line music library. It explores the potential of using a record store and record label to unite, educate and uplift a community through recorded sound. In 2011, Illuminate Productions brought the critically-acclaimed multi-media project Never Records to London. This designed mock record shop only stocked records pressed in store and the public were able to book a free 3-hour recording session, with no auditions necessary. 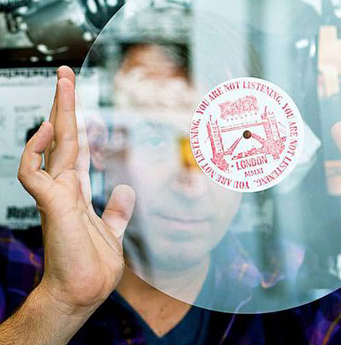 Using microphones and a specialist vinyl-cutting turntable at one end of the ‘store’, Ted Riederer recorded musicians on the spot, mixing on the fly and cutting straight onto vinyl in front of the performers, before giving them a freshly-pressed 12-inch record. Making only two records, one was given to the recording artist; the other was stocked in the Never Records shop to become a permanent exhibit in the store to be played by visitors on the store turntables. Posters and artworks covered the shop walls and individually-designed record covers were designed by the artist, as well as by other artists such as Scott King and the legendary Ramones art director, Arturo Vega, who also designed a t-shirt for the installation. A gallery of photographs, artworks and flip through vinyl represented the hundreds of folk artists, punk bands, storytellers, jazz bands and ‘noisicians’ recorded on site. Live music events included a special collaboration with Philip Jeck, the artist and musician renowned for his soaring soundscapes, using vintage turntables and electronics. This was the fourth appearance of NEVER RECORDS since its beginnings in an old Tower Records Store in New York City, its presence at the Biennial Arts Festival in Liverpool, UK, in 2010 and at the Context Gallery in Derry in May 2011. After London it travelled to Kansas City, Amman Jordan, Texas and New Orleans gathering momentum and records along the way. The Never Records archive is still growing and has the potential to travel the world over. Commissioned and produced by Illuminate Productions in partnership with Better Bankside and Tate Modern For MERGE Bankside. Key coverage total reach 3 million. Media included: The Evening Standard, Time Out Critics Choice, Metro, NME, The Londonist, Visit London, View London, Weekend Notes, Londonist and The Quietus. A “one-time refugee from punk and sometime band member,” Ted Riederer armed himself with painting supplies, electric guitars, amplifiers, old LPs, record players, drum kits, hard disk recorders, photography equipment, a vinyl record lathe, and long-stemmed roses as he’s ambled artistically from the Americas to the Antipodes. His work has been shown nationally and internationally including exhibitions at PS1, Nicole Klagsbrun Gallery, Jack Hanley Gallery (San Francisco), Context Gallery (Derry, Ireland), The University of South Florida Contemporary Art Museum and the Dhaka Arts Center, Bangladesh. Ted Riederer is the Founding Artistic Director of Howl! Happening: An Arturo Vega Project, non-profit gallery/performance space in the East Village. The New York Times has described Howl! Happening as, “Instrumental to the history of the area.” Howl! Happening’s thriving publishing imprint A/P/E has included essays by: Ai Wei Wei, Dan Cameron, Anthony Haden-Guest, Robert Nickas, Michelle Grabner, Michael Musto, C. Carr, Nicole Rudick, John Lyons, and James Wolcott. As part of the NEVER RECORDS program, Arturo Vega, (the artist behind the Ramones’ iconic logo, album cover’s and stage designs) was commissioned to create a wall painting inside NEVER RECORDS’ store. 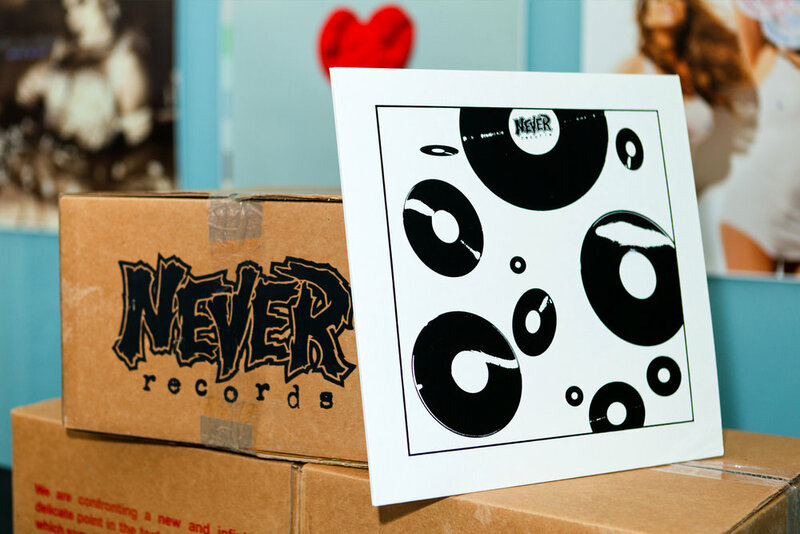 Arturo also created a special Never Records logo for the festival and screen-printed it live and free for anyone who turned up at the Never Records shop with a blank T-shirt. Arturo Vega was invited to talk about his time as part of cult band The Ramones’ inner circle and how his design and logo merchandising became central to the band’s profitability. He also spoke frankly about his career as an artist. Arturo Vega was often called the fifth Ramone for serving as spokesman, logo designer, T-shirt designer and salesman and lighting director. The punk quartet helped rejuvenate rock in the mid-1970s. After the band broke up Arturo continued to design and sell Ramones merchandise and to work with other musicians. Adapting the US Presidential Seal to depict ‘the ultimate all-American band’ The Ramones T-shirt has become a ubiquitous garment, a globally recognised design still today. Arturo was also a painter Influenced by New York street art, newspaper headlines, grocery store signs and even words he heard on the street. Using Warhol’s silkscreen methods and appropriated found images, he forged his art aesthetic from a bold look, primary colour palette and a fascination with the power of words. Vega’s work has been featured in numerous group shows since the 1970s, his solo shows include: CB’s 313 Gallery/New York City (1992); Galería OMR/México, D.F. (2011); Casa Redonda, Chihuahua/Mexico (2012) and at Howl! Happening in NYC in 2015 and 2016. His final painting was a mural on Elizabeth Street featuring an image of Jesus and the words ‘Life isn’t tragic, love is just being ignored’ - lyrics from a song by the Bronx, a punk and mariachi band. Arturo died in 2013 aged 65. For this special Never Records live event Ted Riederer and other musicians who previously recorded in the Never Records studio, collaborated with the legendary musician Philip Jeck. As the musicians jammed at a live performance, the sound was cut onto vinyl by Riederer and then played back over the improvising musicians. The musicians then jammed to the freshly-pressed record and the process was repeated many times, culminating in an immersive soundscape. Jeck studied visual arts at Dartington College of Arts in the 1970s and has been creating sound with record-players since the early 80s. He has worked with many dance and theatre companies and played with many musicians and composers. He has released 11 solo albums, the most recent Cardinal, a double vinyl release on Touch. Suite, another vinyl only release, won a Distinction at The Prix Ars Electronica. His CD Sand (2008) was 2nd in The Wire’s top 50 of the year. Philip also works as a visual artist, usually incorporating sound and has shown extensively including at the Hayward Gallery, London, The Hamburger Bahnhof Gallery, Berlin, ZKM in Karlsruhe and at The Shanghai and Liverpool Biennales. An electrifying and immersive live-music night by cassette-only label The Tapeworm with Swedish sound artist BJ Nilsen, Stockholm-based composer and conceptual visual artist Carl Michael von Hausswolff and London musician Zerocrop. They were joined for live readings by authors from the label’s publishing venture, The Bookworm, and Mike Harding, founder of audio-visual label, Touch. Other highlights included an exhibition of drawings by comic artist Savage Pencil and A London Eye - a video installation by multimedia artist & DJ Vicki Bennett, aka People Like Us.